Polhavn Woodfabrik is an atelier designing and creating custom, handcarved wood pieces. 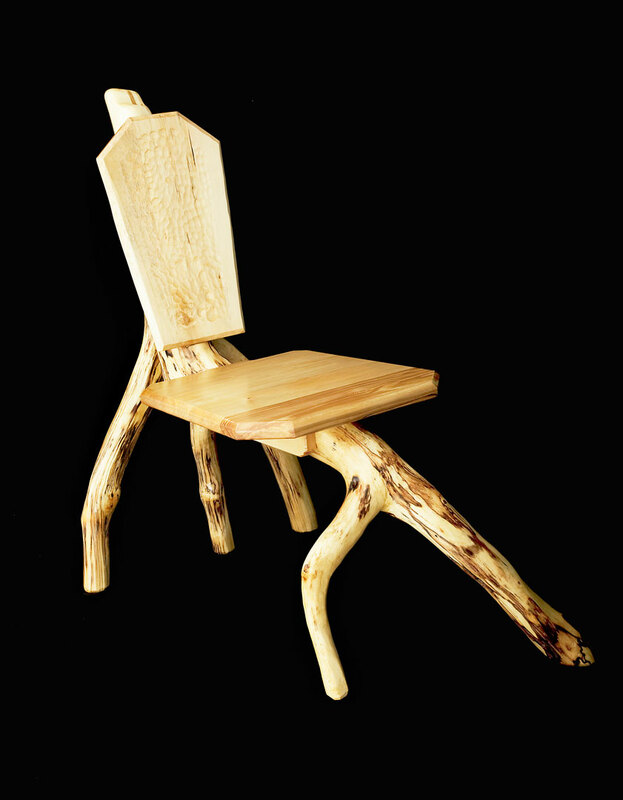 Objects crafted range from signs and furniture to artistic decoration and sculpture. 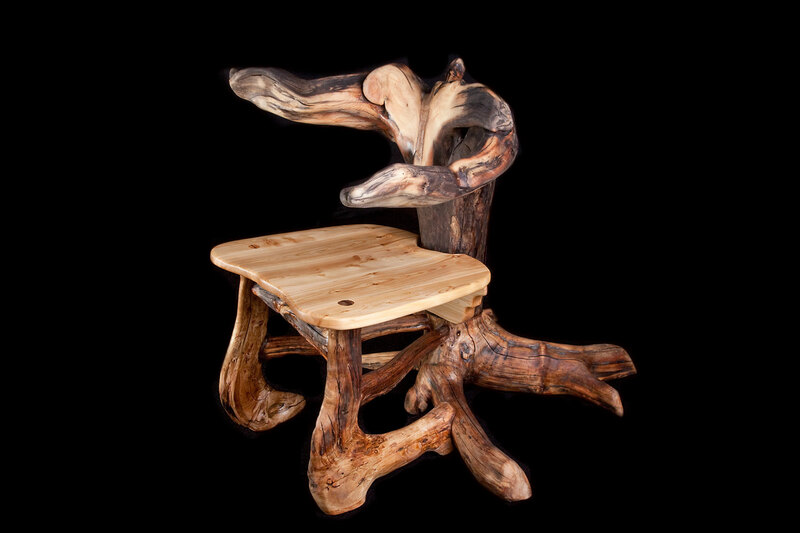 Specialities include rustic furniture from the Alaskan forest to foreign-style folkcrafts. Select -quality local white spruce and paper birch, supplemented with alder, aspen and willow, are featured. Many works are executed in basswood and pine since Philip Marshall, the owner and woodcarver, has been trained in the European tradition using these woods. He uses hand gouges and chisels with a mallet in the Swiss-German style. We invite you to peruse our image gallery on this introductory page and in the subsections noted in the lefthand margin. If you do not see want you want, we welcome enquiries through the addresses at the bottom of the page. We can help in the design, choice of materials, size, and finish (and installation, if local), then provide a timeline and pricing, including shipping. 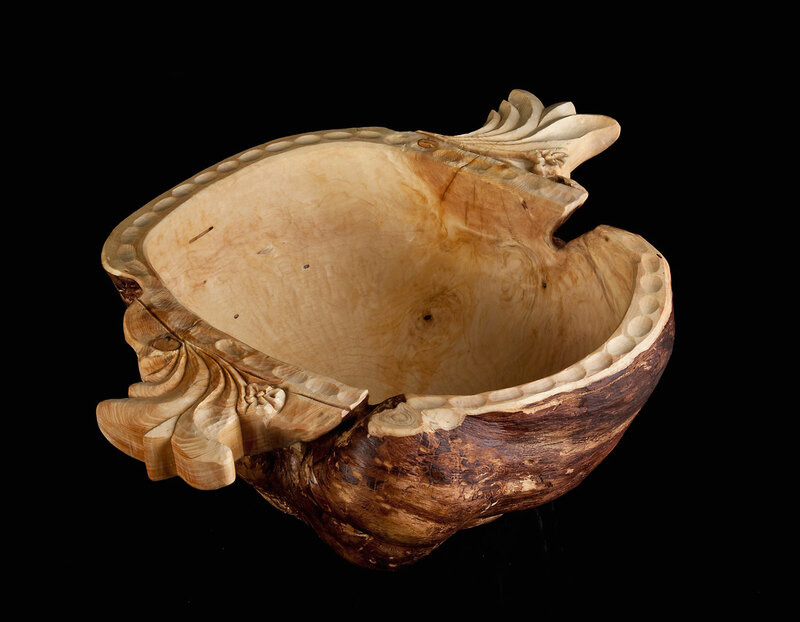 Spruce Burl Bowl. This is a large, single–piece white spruce (Picea glauca) burl harvested from a standing dead tree still intact. Roughed out with a chain saw, it was later shaped by hand with traditional European gouges, chisels and mallet. Its handles are hand-carved with a German acanthus leaf design. No sanding, only tooling, has led to the finish. Holes were sealed with clear epoxy. Danish oil is on the exterior, Clou organic finish (citrus oil-based; food-compatible) covers the inside. 24”L x 18”W x 10”D; white spruce; November 2009. Price: $300. Skeleton Chair #1. New design for an Alaskan vernacular style. The back post, seat strut and front legs are all one piece- a very rare natural growth configuration. The rear legs are a trident (the intended original bow broke!) dry fit with chalk in a lap joint to the back post, then glued and screwed. Additional stability to the seat comes from two cleats fitted and screwed to the strut. All screw holes are plugged. The Alaskan birch was spalted for a year to add character. The back slab was gouged for texture. Three coats of interior satin polyurethane finish the piece. 34"H x 18"W x 36"D; Alaskan birch; June 2010.